As part of their promotional campaign for the release of The Words, CBS Films wanted a thought-provoking infographic that could shed light on the complexities of the multi-layered film, with an aesthetic that made it as much a work of art as a storytelling instrument. While the infographic needed to highlight some of the film’s intricacies, it also had to maintain a sense of intrigue – no one likes a spoiler, no matter how interesting or nice it looks. 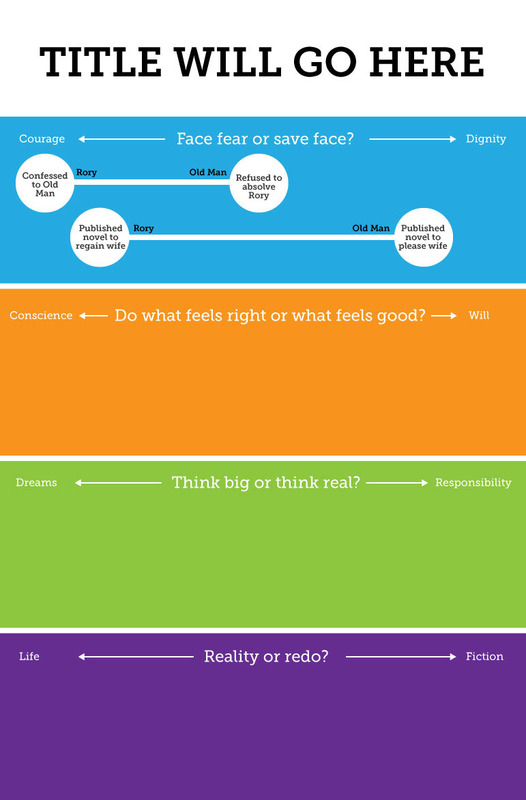 After viewing the film and brainstorming how to interweave its various elements, the JESS3 team highlighted four potential areas of illumination: the relationships between characters, the overlapping story layers, the characters’ moral dilemmas, and the sequence of events. 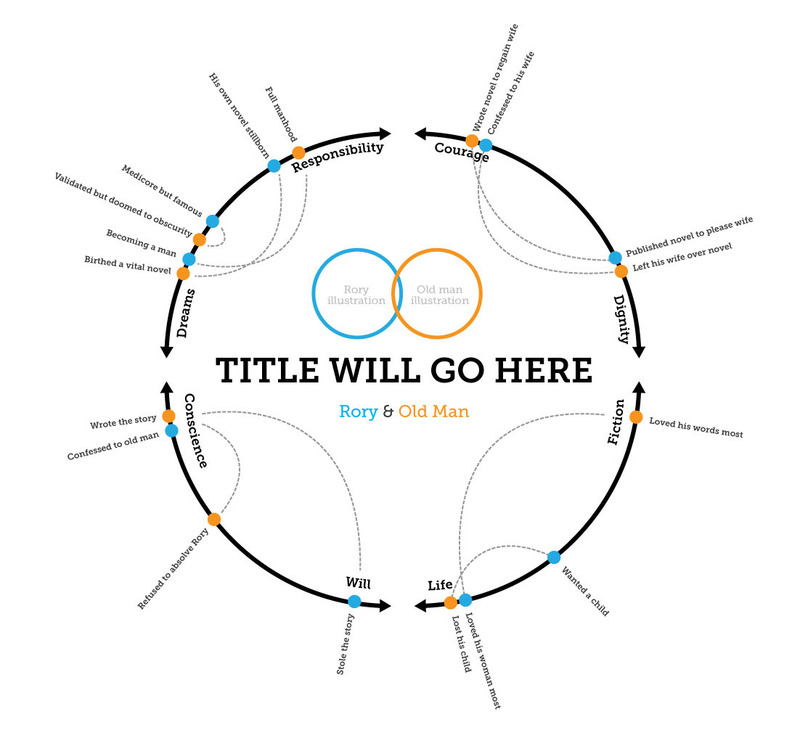 The team mapped out key plot points, quotes, and symbolic objects from the film, all of which supported the development of the infographic but couldn’t be included since they would give away too much. 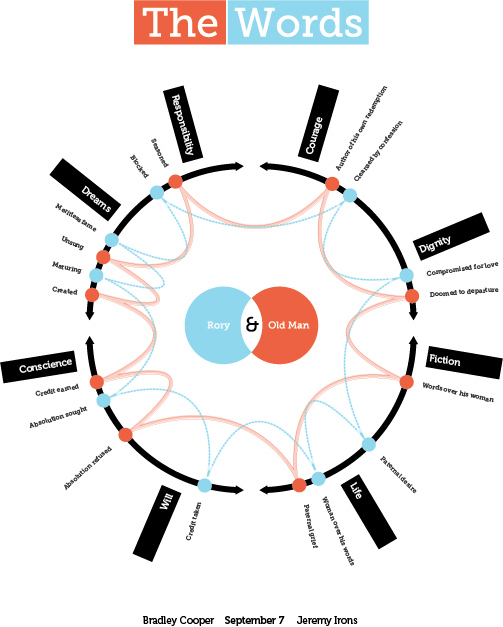 This information was then abstracted to draw parallels between the two primary characters, Rory (played by Bradley Cooper) and the Old Man (Jeremy Irons), the challenges they both faced, the decisions that drove them down their divergent paths, and their respective fates that resulted from those decisions. JESS3 and CBS decided that the focus would center on the moral quandaries presented in the film, which were not simply about choosing between right and wrong, but rather about choosing between being humbled by reality or trying to rewrite it. 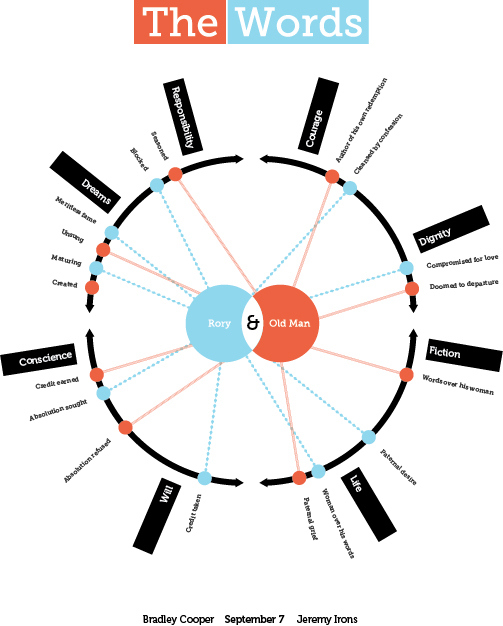 The final infographic is a “moral compass” with four axes representing sets of values that Rory and the Old Man are each forced to choose between: life vs. fiction; conscience vs. will; dreams vs. responsibility; and courage vs. dignity. The characters’ choices are plotted along each axis, with captions that hint at their fates yet leave plenty to the imagination, or to later be uncovered – but only in theaters.